To “follow a path” and then “dissolve”. To carry on your back the dead singing lullabies. To think you have the trees “all mapped out” when their nature is uncertain and “bending under the weight of the wind”. Alyson Hallet is an I ‘orchestrated’ by fossils that “carve gills in my neck”. She does not pretend to be able to “ungull the gulls”, but she does not retire, in the face of this, into quietism; instead she plunges onto the path “wondering at the conversation / between feet and road”. It is in the space between the walker and the walked, between “skin and sun, eye and stone and tree” that Hallett draws her maps. This between is alive to Alyson Hallett. When she kisses a pebble she sees “the moisture from my lips / sink in”. No wonder then that she does “not believe in the otherness of the dead”. But she can look at otherness with suitably perverse affinity. She can find a “measure of nothingness” in the skull negative of a handmade bowl. She can ponder whether “nothing has something to give”. She can hover horribly between a treatment that has “pushed death to a more distant shore / or made no difference at all”. She pivots one poem around “the darkest / parts of ours souls”. I am surprised to be quoting such excessive and luxuriant phrases. In the contexts of the poems of Suddenly Everything they emerge in a vernacular of feeling, as fluent and unpretentious as raw conversation. These poems are studied only in their elegance and observation, they do not demonstrate themselves, but yearn to be off, away, deeper. 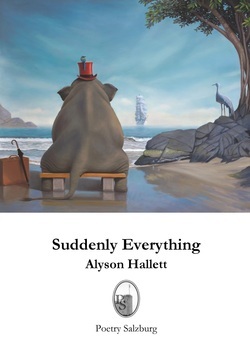 I liked a previous collection of Alyson Hallett’s poems, The Stone Library, so much that I made it a rare poetic entry in the ‘panography’ of my Mythogeography book of 2010. I like Suddenly Everything even more. If a poetry can teach us not how or what to feel, but to feel, then this is one. Bringing the same sensual and historical intensity to poems of love and loss (and loss it is, for when it goes its ghosts return always and eventually) and of stones and to poems of distant, anonymous figures. An angel of history Hallett is, beating with a gentle and adventurous passion that, uncorsetted, drags continents in its heartstrings. .